Eltronicschool. - This is one of the best Arduino project for you who want to develop your ability in metal detector system in this time. This article will discuss to you about how to build metal detector using Arduino Nano. 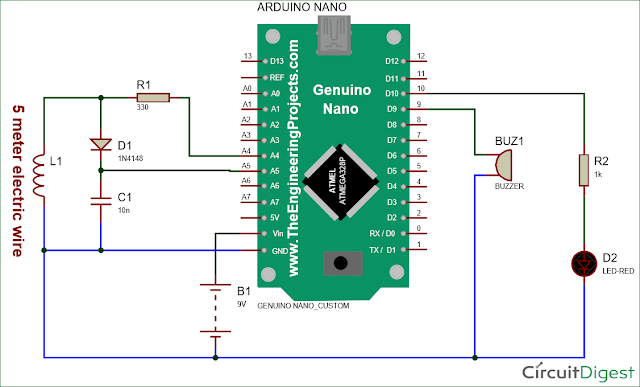 Beside we will give you the circuit schematic of metal detector using Arduino Nano and also the simple description of this project, and the last we will give you the link to read more about this project from original source. Circuit schematic like in Figure 1 above is metal detector using Arduino Nano. Accordingly Circuit Digest site describe that Metal Detector is a security device which is used for detecting metals which can be harmful, at various places like Airports, shopping malls, cinemas etc. Previously we have made a very simple Metal detector without a microcontroller, now we are building the Metal Detector using Arduino. In this project, we are going to use a coil and capacitor which will be responsible for the detection of metals. Here we have used an Arduino Nano to build this metal detector project. This is very interesting projects for all electronics lovers. Wherever this detector detects any metal near it, the buzzer starts beeping very rapidly. Arduino Nano is used for controlling whole this Metal Detector Project. A LED and Buzzer are used as metal detection indicator. A Coil and capacitor is used for detection of metals. A signal diode is also used for reduce the voltage. And a resistor for limiting the current to the Arduino pin.